I think I can speak for Kathy too….we both feel really badly that we haven't been posting. My schedule right now is C-R-A-Z-Y with finals, grading and wrapping up the semester..not to mention Christmas. It seems Christmas is coming too fast, since Thanksgiving was so late. With that in mind…I spent all day in my art room today. I hadn't seen those walls in weeks! Today's card is for my nephew. He is only 4 months old but my sister has purchased a special box to save all his cards from me (Which I think is very sweet). I can't wait to meet him in January for the first time! This card isn't done justice in the photo. First of all, the blue is actually TEAL and even with color adjustment, I couldn't get it to look right. I think it's because I took the photo in a north facing room. Secondly, there is a lot of special cutting and popping up with foam tape. Also stickling. I'm not sure it all quite comes out so I tried to post some closeups. 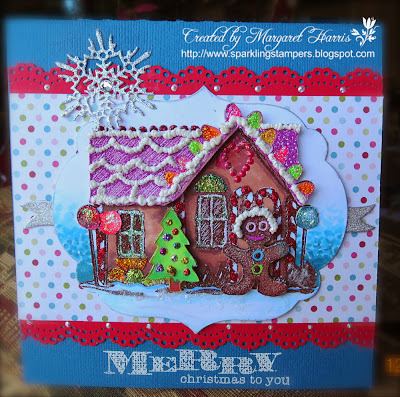 I will be honest…I love this stamp--but it was just as challenging to work up as it looked! However, I'm really happy I went ahead and worked on it--it's been one of those stamps sitting around in my drawers for years! Very beautiful card Margaret! I love that gingerbread house!